Go-Ahead Group is one of the UK’s leading public transport companies, operating buses and trains across most of the country, although primarily in London and the south east. In this post I’ll look at Go-Ahead‘s financial track record and balance sheet, and outline why I wouldn’t invest in the company, even if the price was significantly lower than it is today. As a general rule, operating buses and trains is a defensive business as people need to travel around regardless of the wider economic environment. 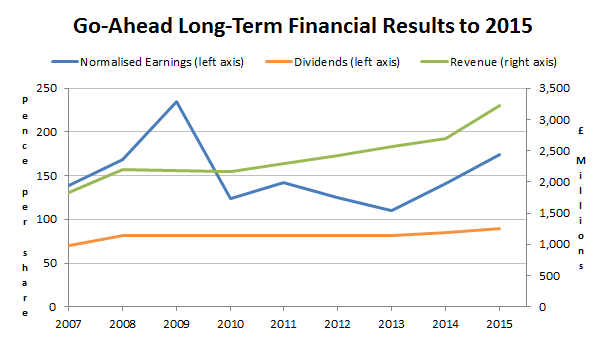 Its earnings have danced around somewhat more than I would normally like, but the general picture is one of stability, especially at the revenue and dividend level. Compared to the market average (using the FTSE 100 as a proxy) Go-Ahead’s track record is actually quite mediocre. It doesn’t have a record of high growth, particularly strong consistency (quality) or profitability. Having said that, it’s a rule of thumb and not a hard rule, so I am willing to be flexible. In this case Go-Ahead’s overall growth rate (the average of the revenue, earnings and dividend growth rates) is held back by the earnings growth rate which is negative because of the earnings spike in 2009. It is reasonable to assume that once the 2009 earnings spike drops out of the picture the company’s growth rate, as I measure it, will move back above 2%. However, even then its growth rate will be somewhat anaemic, but that isn’t necessarily a bad thing. If the shares are cheap enough and the dividend yield high enough then even a slow growth company can be an attractive investment. But before I look at a company’s valuation ratios I always like to look at its balance sheet and financial obligations first. There are two main financial obligations that I look at: Interest-bearing debts and defined benefit pension liabilities. While neither is intrinsically bad, both can become ticking time-bombs if they are too large relative to a company’s profits. Looking first at interest-bearing debts (or borrowings), Go-Ahead has a total outstanding of £311m. At the same time, the company has 5-year average normalised post-tax profits of £60m. Go-Ahead operates in the Travel & Leisure sector, which is defined as cyclical in the Capita Dividend Monitor. And so according to my rule of thumb, Go-Ahead has too much debt. As before, this is a rule of thumb rather than a concrete rule, so I am willing to be flexible. If, for example, I thought that for one reason or another Go-Ahead could easily handle that amount of debt then I might turn a blind eye to this rule of thumb, because the company breaks it by such a small margin. In fact that’s probably what I would do, given the company’s defensive business model; so let’s move onwards and look at Go-Ahead’s defined benefit pension liabilities. The risk from pensions is that the pension scheme’s assets will not be sufficient to cover its liabilities (i.e. will not generates sufficient income to pay those future pensions). When a pension scheme’s assets are worth less than its liabilities there is a pension deficit, which the company can be forced to pay. To measure the risk of a dangerously large pension deficit I use the pension ratio, which is the ratio between a company’s pension liabilities and its 5-year average normalised post-tax profits. 10 isn’t a magic number, but it is the amount where a 10% pension deficit (a fairly typical figure) would give a deficit equal to the company’s average post-tax profits. I think that’s a reasonable definition of a “large” deficit, which could become a significant drain on the company’s cash if the pension trustees insist that the deficit gap be closed. On the railway side of Go-Ahead’s business it seems that the government is expected to foot the bill for any pension deficit, so I’ll ignore that for now. Much like Go-Ahead’s debt ratio, its pension liabilities is also slightly over the limit. That pension risk is reflected to some degree in the related pension deficit, which is running at a not too bad 8%. However, even that fairly small deficit translates into £60m shortfall, equalling an entire year of the company’s profits. That, of course, is heading towards double my rule of thumb maximum of 10, so although I like Go-Ahead and it does appear to be a good business in general, its financial obligations are simply too large for my liking. As a result I won’t be investing, even if the share price fell off the proverbial cliff. P.S. FirstGroup is a good example of what excessive debts can do, even to relatively defensive public transport companies. P.P.S. I have invested in Go-Ahead before, but at the time my debt rules were more lax and I didn’t look at pensions at all. John, Good summary — This and First Group, are not and never will be on my investment horizon. 1. A solid hold on IP and have a strong position in it’s market relative to competition. 6. It’s grown it’s revenue and earnings (in cash) above inflation. 10. It’s potentially a bid target – although this is a bonus and not a prerequisite – hence 10 on the list. Hi LR, interesting and sensible list. How do you know if a company is potentially a bid target? Hi John, I guess you can read the runes so to speak, to determine if it might be a bid target. It’s never certain of course, but sometimes you can judge the size of the company relative to others and it’s success in particular markets that make it interesting to bigger companies with weak positions in those markets. SabMiller is a good example (strength in Africa etc), Imperial smaller, faster growing than peers, strong in e-cigs, and has a newly penetrable growth position in the US due to Lorrilord situation, less exposed to lower margin emerging markets etc. Not an exact science, agreed, but just one small piece of the puzzle – a bonus potential. On another topic, I reread your article on Unilever and wanted to post a little story here that might interest you, as I agree with your analysis. I also wanted to promote a discussion separately about the trend for some gurus (Terry Smith as just one example) to shift the analysis of valuations of companies conveniently away from P/E’s and PEG factors to “Cash Flow Yield” — I did this for Unilever and it’s fallen off a lot naturally. Quite by chance, I was making a calculation of annual gains on Unilever, and noticed that I sold on the 29th of Jan 2016, the same day as in 2015. During both years I’d purchased the stock only within the year and sold effectively at the end of the January in the following year if you get my drift. Obviously on top of that we have the blessed divi – so I need go back an add these in, but it kind of indicates (ignoring the timing of the individual purchases), that the stock price growth could be slowing, realistically I suppose reflecting in the slowing growth of the company. Not being an economist (one up from a philatelist or estate agent I believe) I can’t say what effect the overall world economy is having on ULVR’s performance, but I assume it must be hurting it, as ULVR has performed better than it’s peers. I promise to report the numbers on January 29th 2017 for interest, assuming Mr Market allows me a decent re-entry into ULVR, and I know you just can’t wait!! Gripping story that this is, it does kind of start to reflect the divergence in the growth of the divi at the expense of real growth in revenue and earnings — in your previous Unilever article John. LR — Off to the gym now!! Hi LR, re the potential target thing – I thought it might be something like rune reading. That’s fine if you can do that sort of thing, but I can’t and so I try to stay well clear of that sort of thing. As for free cash flow yield, it’s popular and I have looked at it a couple of times but haven’t been able to make sense of it yet. At the end of the day all these things have problems. Dividends can be cut, earnings can be far removed from reality and free cash flow can be increased by under-investing in capital assets. However, having read Terry Smith’s book “Accounting for Growth” (which analyses companies in excruciating detail), I’m sure that he and his team use all manner of measures beyond free cash flow yield in their analysis. They probably have some way to measure if a company’s capex is too low given the capital intensity of its operations and its targeted growth rate. But I think I know what you’re getting at. When one measure (yield or PE) doesn’t look attractive, investors will often turn to novel metrics which do look attractive (such as price per million website views, or other such rubbish from the dot-com era), regardless of their usefulness in the long-run. Any plans to extend your coverage to foreign companies? It would seem to me you might find better candidates with a wider pool. Its fairly easy to buy US and Canadian stocks with a UK brokerage account at somewhere like TD. Hi Andrew, no plans for that at the moment. I agree that a wider pool of stocks will increase the number of attractive opportunities, but there are also costs such as getting used to different accounting and reporting methods and time spent organising and ranking the data. For now I’m happy to focus on FTSE All-Share stocks as the number of opportunities there (around 230 stocks with a 10-yr unbroken record of dividends) seems to be sufficient to build a good defensive value portfolio. I believe the DfT is ultimately responsible for the pensions of the UK rail franchises. Also I seem to remember there may be some special arrangement for debt attributable to certain franchises (maybe it was that if they loose a franchise then the debt is transferred to the new franchise owner, but I’d need to check on that & I’m in a rush right now). It’s certainly one that is more complex (risky) than the average investment and does and give a premium for this extra complexity, so as you say, not attractive! Hi Ric, that’s right. There is a substantial bus business but Go-Ahead effectively isn’t liable. However, the pension mention in the post is for the bus business only which, as far as I’m aware, they are responsible for. As for debts you could be right in that bits of it may be linked to specific franchises, but if they are then that certainly isn’t clear from the annual report. Note 20 to the accounts says there is a £110m syndicated loan and a £200m 7.5yr bond. It’s a shame because Go-Ahead is the sort of company I like, but I have seen enough debt and pension related issues in the past to make me especially wary of both. This is my two pence worth of “special situations”. When you own good companies, you will get involved in “special situations” and sell sometimes for more that is worth for. It is what you do after these special situations that makes a huge difference. I am not looking for them, but I was caught in many in the last two years, expecialy in the healthcare sector where I had overexposure to biotech and pharmas companies. The big global pharmas have spent $80 billion in acquisitions only last year. One thing I learned is that after companies spend billions on acquisitions, at inflated prices, you better stay cautious in your estimates, so I sold off the lot of healthcare businesses in the last two months. Mr Market is throwing better opportunities elsewhere. Some of the biggest UK pharmas dividend has gone uncovered this yea. For their sake and for the sake of many investors in the UK I hope the investments made in the last two years will come good and earnings will start surprising me, because if not, there will be carnage. Thank you for your article and your arguments! Go-Ahead has fallen sharply and the current net debt is £239.3m. Divided by the profit after taxes is a 4. They also have Net cash of £323.0m. The pension liablities are up to 765.8, but also backed by assets at fair value of 763.1 (Note 27). Maybe my questions are stupid, but I don’t understand your concerns related to this numbers? There can be threats – i know – but pensions and debt is backed up by cash and assets. As I understand it, pensions are more or less a topic for the coming future. The company is existing since 1987 and much of the growth just took place recently. Hi Ebdem, I’n not necessarily saying that Go-Ahead’s debts and pension will cause problems, but they are risk factors that are currently beyond my comfort zone. In terms of debts, there is cash which offsets some of the debt, but I don’t look at cash. My simplifying assumption is that the cash is there as part of the company’s working capital and is not available to offset or pay down debts. If there was spare cash on the balance sheet the company should have already done something productive with it, like pay down debts or return it to shareholders. As for the pension, there are assets to offset the liabilities of course, but with large pension liabilities the risk of a large deficit is increased, and a large deficit has to be reduced by law, and typically it’s reduced via cash payments agreed with the pension scheme’s trustees. Again, this is just a risk that makes me wary. These are both risks that can affect the company in the near future and not just the far future and for me they are reason enough not to invest, even though I otherwise like the company. Thank you, John. Now I see your points clearly. You are taking a risk averse stance here, which is very acceptable. I am wondering if there is a certain price, that makes you accept these risks of this interesting company ? No, there isn’t a price that would make me ignore those debt and pension risks. However, if those risks weren’t there then I might be interested at something below £15, or perhaps more if the company can continue its recent growth spurt for a few more years.